SBP Emergency Services keeps hospital 'operating' - utilizing their unique and specially designed distribution system! Emergency and disaster relief preparedness is having a backup plan to sustain clinical operations. It was a very sensitive issue at this hospital when their main service was beginning to fail. They literally had to pull the plug on every device and room - including the operating room - and find a way to re-supply power from an alternate source. Without a cohesive plan, many essential services would be interrupted; labs, hospital rooms, operating theatres, emergency rooms, food services, diagnostic equipment like X-Rays/MRI equipment...the requirements would be staggering! The problem: How do you keep a major urban hospital operating on a 24/7 basis while their electrical is literally 'taken off the power grid' in an effort to diagnose and repair the problem? Lives literally depended on a single source solution and quick deployment. The Solution: SBP Emergency Services, utilizing our unique portable sub stations and our specialty design experience to re-route power to the entire hospital and allow critical services to continue for the community. 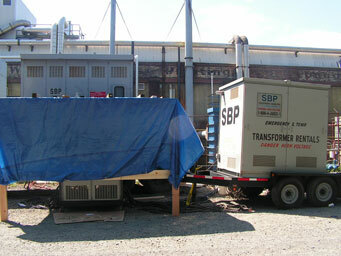 As this hospital required 2 large generators, SBP also furnished a mobile backup generator on site in the event of a failure of primary systems. 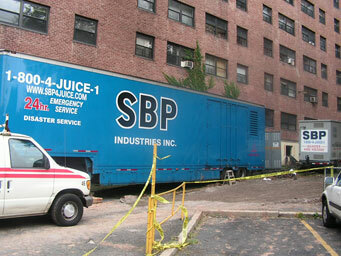 Visit our gallery to see full photos of how SBP came to the rescue and provided this unique and life saving solution! Here a 400+ apartment complex lost their entire electrical service in the middle of the summer. The problem here was not only did they need power, but they needed to have a distribution panel that could handle that many units. SBP’s Solution was to provide the user with a large enough generator, a transformer to change the voltage where needed and outdoor distribution panels ( with all the necessary cables), so that electricians could work in the existing electrical room to repair the damage. The result was the entire complex was back on line including the elevators and outdoor lighting. Here a major pharmaceutical company lost a 13.2Kv/240v indoor transformer. The problem here was that their electrical was a 240 Volt Delta system and no one could supply them with any equipment that would give them the required voltage and amperage that they needed in order to continue production. SBP’s Solution was to engineer a way to give them their required voltage and ampacity by using various types of transformers to give the customer what they needed as well as all necessary cables including the high voltage cable required. The result was that the company was back in production after only two days.